Released in 1953 and based on tales of the old Wild West, this shoot’em up musical stars the beloved Doris Day in one of her most remembered singing roles. 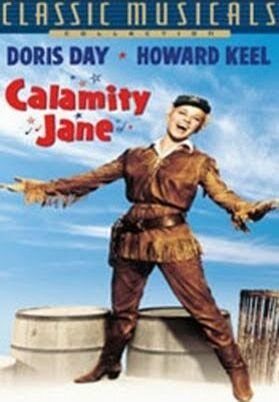 “Calamity Jane” was made by Warner Brothers in response to the success of “Annie Get Your Gun”, but for many surpassed that success due to the dynamic performance of Day. Calamity Jane (Day) is a shotgun messenger on the stagecoach and on a dare by Wild Bill Hickok and to save the local saloon in her hometown of Deadwood, “The Golden Garter”, she rides into Chicago to find the famous femme fatal singer, Adelaid Adams, to star in their show. Returning to Deadwood with the singer, Calamity (Day) discovers she has mistakenly brought back an imposter named Katie (actress Allyn Ann McLerie). The Wild West audience becomes smitten with the new singer Katie regardless (with a little help from Calamity’s shooting skills to convince them). The two women (Calamity and Katie) become good friends and decide to share a home together giving it a woman’s touch. However, the two soon become rivals as they discover they are both in love with the same man, Lt. Daniel. Calamity (Day) threatens Katie in a jealous rage, which turns the town of Deadwood against Calamity. In the end, Calamity realizes she was in love with Wild Bill Hickok (played to perfection by Howard Keel) all along and the movie happily ends with a double wedding. Doris Day is an American treasure and this film could not be made in the cynical Hollywood of today. Political correctness would sour the storyline and the innocence it represented. Day is as always, adorable, delightful and the original female role model that still stands the test of time for any young woman today. I dare anyone to watch this clip of Day singing and not smile, feel happy and spend the rest of the day humming its tune. But most of all, wish we had more like her today.